It's Facebook Fridays! for March 31, 2017! and we are bringing you the history, teachings, traditions, and full instructions on how to become a practitioner of candle magic! The Lucky Mojo Curio Company is holding a random drawing to give away 5 enlightening and edifying Candle Magic spiritual supply prizes. 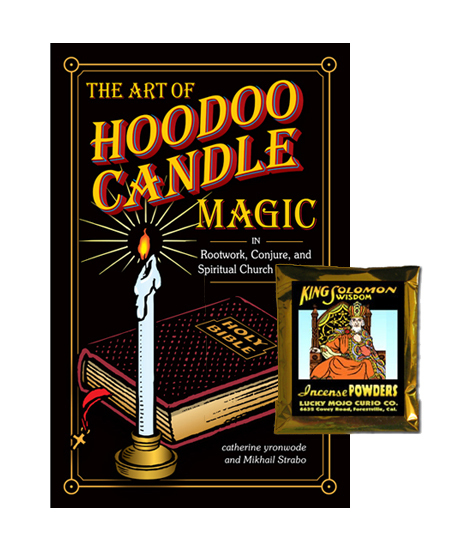 This week five lucky winners will each receive a copy of catherine yronwode and Mikhail Strabo's magnificent guidebook, "The Art of Hoodoo Candle Magic," along with a packet of Lucky Mojo brand hand-made King Solomon Wisdom Incense Powders for use on the home or church altar to increase mental powers, enable wise decision-making, and bring about an intimate knowledge of the occult. First thing tomorrow morning, we will select FIVE winners at random, announce their names here, and ask them to message this Facebook Page with their mailing addresses, so we can send them their FREE Candle Magic products. We have a winner! In fact, we have 5 lucky winners! Our Facebook Fridays! winners for March 31, 2017 are: Kat Burns, Dionne Kuria, Madison Barry, Je M'appelle Tongela, and Erik Winsor.